The Image element has a great text overlay feature where you can place and style text on top of an image. 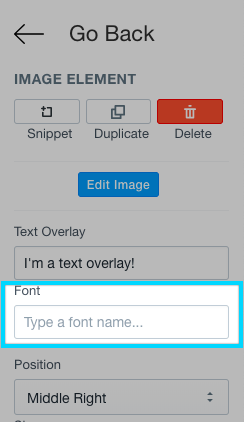 The image element now has a text field for creating beautiful text image overlays. 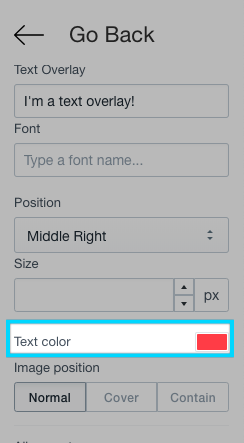 Please note, the text overlay feature will be deprecate soon, please use the Text Element on the Image Element instead. Overlaying elements on your Image Elements can be a great way of showcasing your content. The Image Element is a containing element, meaning that you can drag other elements on top of this element. This works similarly to the Section Element. The fonts from the Image Element overlay is provided by the Google Fonts API. You can set the color of the text in your image overlay using the color picker provided by the editor.